Collagen is the main protein that makes up the connective tissue in animals and is the most abundant protein in mammals, making up about 25% - 35% of the entire body protein content. It’s the main component of tendons, bones, ligaments and skin. In skin tissue, it’s responsible for strength and elasticity and, with aging, its’ deterioration leads to fine lines and wrinkles. It is commonly used in cosmetic surgery, burns surgery and as a food supplement (gelatin). Collagen injections are a convenient way to smooth wrinkled skin in order to provide a more youthful appearance with virtually no recovery time needed. It is a non-surgical procedure that can be performed during one’s lunch break from work (for example) with no loss from work or daily activities. By injecting processed, purified collagen into various facial areas, the patient’s natural collagen is replenished, which helps improve upon various signs of aging. Note: Collagen should be injected into your skin only by a trained, experienced health care professional. The benefits and risks of collagen injections should be discussed with an expert, prior to making the decision to have collagen injections. There are two types of collagen injections: bovine collagen and human collagen. Bovine collagen is made from extracted cow skin and is very compatible with human skin tissue. In most cases, the body will readily accept it as its’ own tissue. Zyderm® and Zyplast® are two of the most popular bovine derived collagen products which can be injected, just beneath the skin, replacing the collagen your skin loses over time. Although there is a high success rate associated with bovine collagen injections, there is a percentage of patients who are allergic to bovine collagen products. Because of this, prior to injections, a skin test is mandatory to determine if the patient would have an allergic reaction to this type of procedure. Human collagen is a bioengineered product and comes from human donors. CosmoDerm® and CosmoPlast® are human collagen products that are used for similar procedures as the bovine collagen products Zyderm® and Zyplast®, but have the advantage of usually not requiring an allergy skin test prior to the first treatment. In the past, a skin test was mandatory for human collagen products. However, the manufacturers now test their collagen stock for known pathogens and contaminates and the collagen is then purified for preparation for use in injections. The best candidates for collagen injections are between the ages of 35 and 60 with smile or frown lines, “crow’s feet”, who desire fuller lips or have had a face lift or brow lift and desire to touch up the smile lines or frown lines without further surgery. The patient should be in good health, both physically and emotionally and have realistic expectations of the procedure. People who should not receive collagen injections include those who are pregnant or nursing, people with allergies to cow products or lidocaine and anyone with AIDS or similar autoimmune disorders. 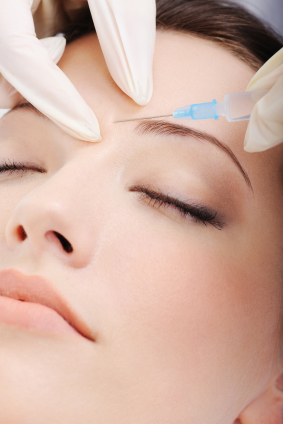 Getting a collagen injection is similar to receiving an injection from a standard needle. However, individual response may vary. For those with chronic Herpes Simplex a severe outbreak is possible should their immune system detect the presence of a foreign substance. Every consumer should be aware of both the benefits and risks associated with collagen injections by becoming as educated as possible through research and discussions with their health care provider. When used in qualified candidates, collagen injections can provide a non-invasive way of minimizing wrinkles by raising the level of the surrounding skin. Prior to the injections, the sites to be treated are identified by the doctor and those areas are cleansed and disinfected. No anesthesia is required since pain will be minimal. The actual collagen injections are typically quick, and take around 30 minutes to an hour. However, the procedure may last longer if multiple sites over a larger area are to be treated. The collagen is injected, just below the skin surface, at multiple points along the edge of the treatment site. A fine needle is used and the area is over-filled to allow for subsequent absorption. The over-filling will create a temporary swollen effect but it may also reduce the number of required return visits to the doctor’s office. One of the main advantages with collagen injections is that there is no significant recovery time. Immediately after the injections, you may experience some minor swelling and bruising which normally subsides within 48 hours. The actual treated area(s) may exhibit redness for the first 24 hours - this may last up to a week. If you experience sudden, severe pain or any symptoms that are unexpected – you should immediately contact your doctor or the on-call medical support team. Although collagen injections represent a relatively simple procedure, there are possible risks and complications that are associated with collagen. As with any cosmetic procedure, side effects are possible. Collagen injections are not for everybody and some patients can experience allergic reactions. As mentioned before, skin testing is mandatory with bovine collagen injections and may even be necessary in some cases of human collagen injections. Before determining if collagen injections can benefit you, two skin tests in a one-month period must be performed (two weeks apart). Even if the tests come back negative for allergic reactions, some people can still suffer them. It’s common to experience minor swelling, itching or redness during the first 24 hours after treatment. Allergic collagen reactions can present as red, tender bumps that may ulcerate and cause permanent scarring. But the side effects are usually temporary and will dissipate over a period of several months. Some patients may also experience a bacterial infection. In all, about 2% of patients experience these side effects. It should also be noted that, as mentioned earlier, there will be a temporary swollen effect due to initial over-filling of collagen during the procedure. This is done to allow for the saline (salt water), which makes up part of the collagen injection, to be absorbed over the first few days directly following the injections. This is normal, is usually discussed with your doctor prior to receiving injections and should not be alarming. Collagen can be an economical, effective way to sustain a more youthful appearance for those who possess mild to moderate signs of aging and skin tone that is still relatively supple. Remember, however, that collagen is not permanent and the per-injection cost varies based on the area treated and degree of cosmetic surgery involved. Individual collagen injections range between $275 and $400. Exact costs vary depending on the region and the doctor’s fee. For patients that require multiple injections, the cost will naturally be higher. For a complete session, patients should expect to pay about $700. Because of its’ variables regarding costs - those seeking collagen injections must be sure they have been made aware of the entire procedural expenses. If this can’t be obtained in the initial consultation, an estimate of costs should be requested. Since this is a cosmetic procedure, medical insurance coverage will not apply. However, you can request financing options from your doctor in order to make the procedure more affordable. 1. What are the realistic expectations of this procedure? 3. What type of collagen will be used and why? 6. What is the doctor’s level of experience? How many injections have he or she performed? 7. What percentage of patients experience complications? What are those complications? 8. What can I expect in terms of discomfort from the procedure? How long will this last? 9. What are the total costs for the procedure? 10. What are the details of the procedure?